Artist Made Coasters proved to be one of the most successful exhibitions of 2012, and Made is doing it again for 2013. These unique artist made coasters have two things in common – they’re practical and creative. They serve to protect tables and other surfaces from the dreaded “water ring” caused by cold, sweating glasses or hot cups. Additionally, they go a step further and add a special touch to a room. Invited to take part last year, I enjoyed and continued making them. People let me know they used them as coasters or sat them as small works on a shelf or ledge. Three of us return to do this again. You’ll see new artists as well. Remember…everyone is asked to reflect their personal artistic style but to keep them functional. Join MADE for an artist reception that includes wine and features Peanut Butter and Jelly cupcakes made by Brendan McCaskey. WHAT: Saving Tables – Artist Made Coasters. My newly designed set of 6 ↓. MADE carries some of my other designs seen here → coaster link. I’m writing this post with appreciation and thanks for the friends who support my work. And I’m writing this post with a practical way to move designs out into new space. An artwork made for a particular event brings different sort of experience. Homage to The Cat – Issa cup of Tea was originally painted for this years Mesa Arts Center fund-raiser. I barely lived with her, as I had to make and deliver within a very short time. I didn’t even sign the small work until I was at the center and saw I’d forgotten. She’s in California now. I have a standing invitation to visit anytime. Jackalope – In the View Finder is a work on paper for who else but Jackalope Ranch our own Phoenix Culture blog. It commemorates their birthday. They made a sticker that showed up … well … across Phoenix, and … America. I liked receiving photos of where the sticker – stuck. 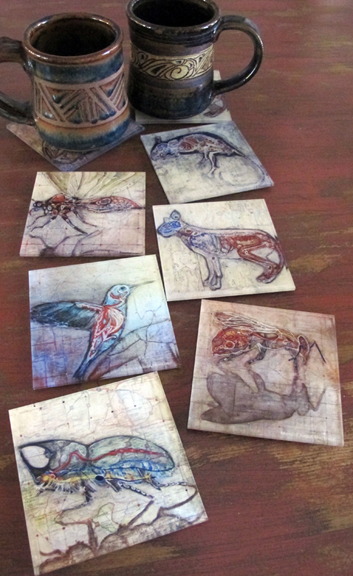 Last month MADE art boutique invited me to take part in an Artist-Made Coasters show. I turned these 2 designs into a set of 6 coasters. Why not. I received direct orders via Facebook, from out-of-town friends. Very cool. And I’ve replenished the art boutique, they sold the initial sets. It will be a limited series, I’ve placed 3 orders, I may do two more. It has been fun moving the designs further. And connecting. How supported am I. It’s a statement not a question. Today I am informed, postcards are in. The cat design, with the help of Facebook again – is now a postcard. Far may she travel. I’ve had lots on my plate this year, but these little side projects have been nice breaks. And one thing has led to another. I’ve learned new things about material, finishes, quality, costs and pricing. I’m continuing with the serious art making, that won’t stop – but I think now and again I’ll work these little practical art works in to my schedule. I have 3 more cats that I used to know in mind for 3 future paintings, maybe a snail, and possibly a bird. The postcard came about through a Phoenix Postcard Competition (yes…MADE sponsored). I was given 200. The rest are at MADE art boutique waiting to be purchased and mailed out. All proceeds go to them. And you’ll also continue to find my coasters there. I placed another printing order for cats and jackalopes and dropped by Mouse to pick them up yesterday. The invite to make a set of coasters, has become a pleasant learning experience. One of which has been to fill orders. When I began pricing process and materials it got a little complicated. I was considering internet printing to save costs. But I wanted to see and feel what I was considering. I wanted to ask questions, have answers. I wanted consistent quality. I am working with Mousegraphics in Tempe. Peggy has been great. All the women there have been helpful. One unexpected value is how they respond to the crafted objects … such great insight for me. I suggested to her to have her son look at my website so he could see the art work these particular coasters are from. The coasters are small and translucent details and the original artwork is large, opaque and more … mmm …. seriously solid. Here is the link Gloria → Nothing In Stasis. Best wishes to your son. And thanks all of you, for your service. Pretty sure I’ll be back for more. I guess I should note: practical but printed objects * hand-made , hand-washed. You can also find them @ MADE art boutique. All through art school one participates in arts and crafts sales, as buyer or seller, or both. I have great, one of a kind earrings, that I bought at Cheap Jewelry sales in undergrad and grad school. I teach at a college and I still have access to hand-made work made by students. And thanks to places like MADE, I also have access to a broader range of handmade – functional objects by area craftsmen and artisans. There’s process to making functional art that includes cool materials, packaging, pricing, and always thinking about the buyer’s experience. I did say already that I’ve enjoyed making these coasters. Initially I declined, and then within a few days I changed my mind. The idea for the designs came from detail shots I shared in Facebook, this blog, and YouTube video’s of my process. I liked the small compositions, and so did others. Well … why not? Surprisingly I think about two different people, while I go about putting my coasters together for MADE art boutique. I think about my mom who prefers the hand-made to the mass-produced. Not only does she enjoy gifting unique objects, she also enjoys the presentation (oh and you should see her holiday table spreads). She appreciates details and interesting wrappings. I think about this when I come up with a way to tie the coasters together. I also want you to see and feel what you are getting. I remember my under-grad professor Rachelle Thiewes and our Metals class. I recall how she handled materials as she instructed. She’d run her hand across a surface with sensitivity and care. I think … small-scale … sculpture. I chose thick Plexiglass for my coasters. You feel the tooth of the printed surface bottom, while the top is smooth. Everything is matte-finish but the translucent coasters have glass-water-light play when you see them as isolated shapes. And the transparent bumpers, not only are they good quality, with strong adhesiveness, but they continue a clean look. The slight lift off the table, allows light to move in the space. I especially like that the footing is circular and seen from above. I designed 2 sets. One is opaque and are homages – to a jackalope (yes that would be Jackalope Ranch) and the other a cat (yes, Issa). Both are designs from this last year. The other set is transparent. They are detail shots of a few of my current works. The drawings and paintings will never have the translucency that these small 4″ x 4″‘s have. They really take on X-ray quality. And they allow whatever surface they sit on to come through the design. In this case below – my wooden, and warm red table top. Note the circular bumper rings, they reference water and serve a purpose. The set of 6 includes various combinations of these designs. I photographed these samples below on a white surface. An enjoyable break for participating in something a little different. I’ve made a dozen sets and I’ll sell some directly, and place others in a couple of places for the holidays. I just dropped a set of each @ MADE art boutique, click ← for more. MADE art boutique invited me, along with 10 other artists, to create a set of 6 beverage coasters for No Sweat: Artist-Made Coasters, the latest in an ongoing series of artist-themed exhibitions. I had to think about things like protecting tables and other surfaces from a water ring. I considered cold, sweating glasses and hot cups. The coasters are not only functional, but are also a decorative element. They reflect my artistic style. Initially I thought I’d print on cloth and did all the research to do so but came up with this idea a week later, while visiting with Mary Shindell. I am very pleased with the look of the small objects. They open a whole new process to me, I’m sure could show up in future work. Today I found clear bumpers to finish the work. The whole design took hold. The opaque ones above are fun. And the transparent ones below, more sophisticated. I have made various sets of 6, and have narrowed down two different completed sets, one of which I’ll leave with MADE next week. The show opens next week and as usual, I hope to run a post with other artist’s work. … tonight, we use our own personally designed set.